Animal studies confirm fears can be acquired through observational learning. In one study, researchers noted how lab-raised monkeys were initially not afraid of snakes. This changed after the monkeys witnessed how wild-reared monkeys responded fearfully to snakes; they developed a strong fear of reptiles. The greater the level of fear shown by the wild-reared monkey, the greater the fear in the observing monkey. This fear was persistent – lab monkeys exhibited the same fear when they saw the same snakes three months later. The same picture emerges from human studies. One study asked participants the question, ‘To what extent do you generally express your fears in the presence of your children – never, sometimes, or always? Mothers who said they ‘always’ did so had children who reported the highest levels of anxiety; the lowest anxiety levels were reported by children whose mothers ‘never’ expressed fears around their kids. In another study, researchers trained one group of mothers to pretend to be socially anxious when meeting a male stranger, with their toddlers watching; a second group of mothers reacted calmly to the same men. Later, the toddlers were introduced to the stranger. Those that had seen their mother react anxiously were ‘significantly more fearful and avoidant with the stranger’. Note that the toddlers were aged just 12 to 14 months – even at this young age, these little detectives are picking up all kinds of messages as to how they should interpret their world. Now, as noted earlier, young kids can also make their parents anxious. 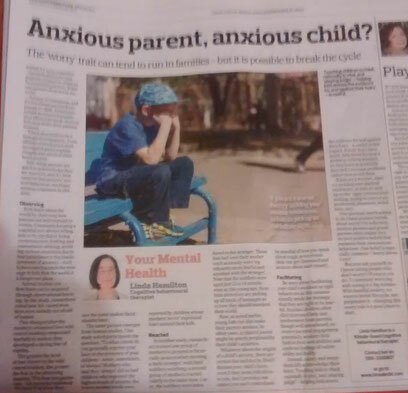 In other cases, a relaxed parent might be utterly perplexed by their child’s anxieties. Whatever about the origins of a child’s anxiety, there are certain dos and don’ts. Don’t dismiss your child’s fears, even if they seem ridiculous to you. Don’t promise outcomes you can't control. Be mindful of how you speak about tragic news events or crime-related matters (kids can get very distressed and anxious about such issues). Be wary about facilitating your child’s avoidant or rigid behaviours as this unintentionally sends the message that they are right to be fearful. Anxious children often elicit increased help and involvement from parents; though well-intentioned, excessive parental engagement potentially weakens kids’ faith in their own abilities and confirms feelings of vulnerability and frailty. Instead, calmly and empathetically acknowledge their fears. Teaching kids to think rationally is vital, and “playing judge” – helping kids assess the evidence for and against their fears – is useful in this regard. If their fears have merit, help them develop a problem-solving mindset, so they learn to gradually face and overcome problems rather than avoid them. If you are a worrier, then try tackling your anxious tendencies, as kids do pick up on the telltale signs (reassurance seeking, trying to control unpredictable situations, avoidance, etc). One question worth asking is: do I have positive beliefs about worry? On reflection, anxious parents and grandparents often realise they do have positive beliefs that maintain their own anxious behaviour. One belief is especially common – “worry shows I care”. Ask yourself: do I know caring people who don’t worry? Of course you do. To associate worrying with caring is a big mistake. With familial anxiety, we want to break the cycle, not perpetuate it – changing this worry rule is a good place to start.